NEW ORLEANS (CNS) — For every sub-sea-level New Orleanian who lives precariously behind engineered levees, the north shore often is considered to be a safe haven from any storm. But when the water from torrential rains and cresting rivers kept rising to historic levels March 11 north of Lake Pontchartrain, there was absolutely no way to dam the flow before it caused unprecedented damage to St. Joseph Abbey and Seminary College and several other areas in the northernmost parts of the Archdiocese of New Orleans. If the great flood of 1927 was the benchmark for high water, the March 11 flood surpassed it by at least two inches, said Benedictine Abbot Justin Brown. The storm surge sent 2 feet to 2 and a half feet of water into every building on campus except for the elevated abbey church and St. Pius X Hall. Making matters worse, because the abbey had not sustained any flood damage in nearly a century, the Benedictine monks long ago had forgone protecting their property with flood insurance. The flood also sent about 4 feet of water into about a dozen buildings at nearby Camp Abbey, owned and operated by the Archdiocese of New Orleans on land that is part of St. Joseph Abbey. 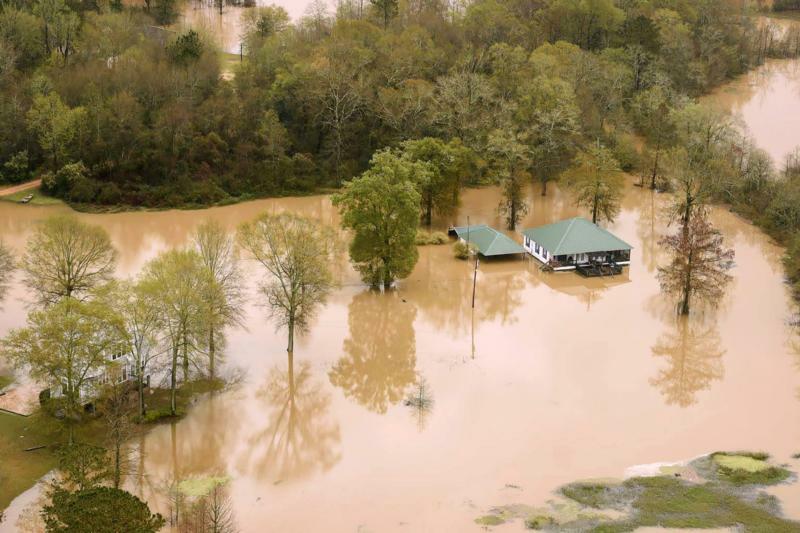 The archdiocese does have flood insurance on every building at Camp Abbey, and it is working on remediation and restoration plans that will allow Camp Abbey’s summer camp to open as scheduled in June. Other properties damaged in the flood were two buildings at Annunciation Elementary School in Bogalusa — one building had flood coverage and the other did not — and the Priests’ Villa in Covington, which took on 5 feet of water. While St. Peter Parish in Covington had no damage to its buildings, the parish organized a massive outreach program to area residents, matching volunteers to those who had specific needs. About 125 volunteers were mobilized to help at least 12 families, Father Otis Young said. Rebuilding the monastery and seminary college will be a monumental undertaking. About 2 feet of water seeped into every building, including the gift shop, library, classrooms, cafeteria and woodworks, where the monks and community volunteers work side by side to make hand-crafted caskets. Deacon Coudrain said by the time he called a few volunteers to see if they could help him move the equipment higher, it was too late. Classes were canceled for the week for the seminary’s 138 seminarians — the largest enrollment in recent history — and were scheduled to resume March 21. The recently refurbished Vianney Hall dormitory sustained damage to about 20 ground-floor rooms. “It’s going to be a challenge to house them, but we will,” Abbot Brown said. Several elderly or infirm monks were taken from their ground-floor rooms in the monastery to accommodations at St. Benedict Parish rectory and the Carmelite Sisters’ motherhouse nearby. The only building not touched at all by water was St. Pius X Hall, which is elevated; it houses the seminary’s administrative and business offices. No water got into the church, but the electrical systems were all located in the basement. The church has been closed to the public until further notice. “For us — and for all people who have been affected right now — we put our hope and trust in our God of providence and care, who will help us get through,” Abbot Brown said. “We are so thankful and blessed for the prayers and support of so many people. As we do our own cleanup and recovery, we’re also aware that many others are in an even worse situation in their homes. We’re praying for them.